We’d love your help. Let us know what’s wrong with this preview of Those Shoes by Maribeth Boelts. All Jeremy wants is a pair of those shoes, the ones everyone at school seems to be wearing. But Jeremy’s grandma tells him they don’t have room for "want," just " But all the kids are wearing them! Any child who has ever craved something out of reach will relate to this warm, refreshingly realistic story. To ask other readers questions about Those Shoes, please sign up. 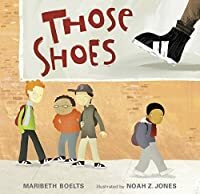 Although the concepts of needs versus wants and the importance of being a good friend are perhaps a bit on the surface and obvious, thankfully and appreciatively, the presented narrative of Maribeth Boelts' Those Shoes is generally realistic and neither too preachy nor sugar-coated. For one, young Jeremy does not immediately and smilingly accept his grandmother's claims that he needs new winter boots more than "those shoes" that everyone at school is oohing and ahhing about (which I for one cons Although the concepts of needs versus wants and the importance of being a good friend are perhaps a bit on the surface and obvious, thankfully and appreciatively, the presented narrative of Maribeth Boelts' Those Shoes is generally realistic and neither too preachy nor sugar-coated. For one, young Jeremy does not immediately and smilingly accept his grandmother's claims that he needs new winter boots more than "those shoes" that everyone at school is oohing and ahhing about (which I for one consider a much more realistic scenario than if Jeremy had immediately accepted that the latter are beyond his grandmother's financial means). And for two, the author has also and again quite realistically depicted Jeremy as not all that immediately grateful to guidance councellor Mr. Alfrey finding replacement shoes for Jeremy when his shoes come apart during a school kickball game. I mean, considering that the only shoes in Mr. Alfrey's collection of hand-me-outs for students in need which are of Jeremy's size are bright blue with velcro instead of laces and that Jeremy's classmates except for Antonio Parker all laugh at him, it is in my opinion both understandable and even acceptable that Jeremy cannot really all that much and immediately appreciate Mr. Alfrey's kindness, but instead feels sad, left out and embarrassed at having to wear shoes that as he states his toddler cousin Marshall should be wearing (and it is indeed truly wonderful that Maribeth Boelts portrays Jeremy as a typical boy with strong likes and dislikes and has not strived to make him appear as holier than thou, as someone who always and immediately accepts and understands life's struggles and disappointments). Furthermore, and perhaps even more importanly, while I just love that Jeremy finally decides to give the thrift store version of "those shoes" (which he cannot wear because they are much too small for his feet) to Antonio Parker (to the only boy in class who has not laughed at the blue velcro shoes and who is wearing shoes that are falling apart, shoes that are being held together by tape), I think I even more appreciate that it takes Jeremy a while to to consider, that he does not immediately give Antonio the shoes, and again very much realistically, that even after having given the shoes to Antonio, Jeremy still does feel both sad and a bit angry at now being the only student in class to not have "those shoes" to wear and that the shoes he must wear are the blue Mr. Alfrey pair about which the other students have been laughing so much. Jeremy's act of kindness and frienship towards Antonio Parker is therefore also tinged with some regret and a bit of anger (not at Antonio, but at the whole scenario and the reasons why Jeremy cannot have "those shoes" namely that his grandmother cannot afford to buy him a new pair and that the thrift store shoes just do not fit). In Those Shoes by Maribeth Boelts, Jeremy struggles with a dilemma at school. All he wants are the shoes that "everyone" else has at school. Jeremy's Grandma tells him that they can't afford the expensive high top tennis shoes that he wants, but they can get the warm winter boots that he needs. When Jeremy's old shoes break and he is forced to wear Velcro cartoon character shoes provided by the guidance counselor, he finds out who his real friends are and what he truly needs not wants. 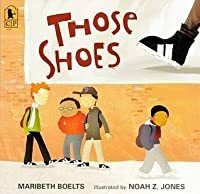 This book In Those Shoes by Maribeth Boelts, Jeremy struggles with a dilemma at school. All he wants are the shoes that "everyone" else has at school. Jeremy's Grandma tells him that they can't afford the expensive high top tennis shoes that he wants, but they can get the warm winter boots that he needs. When Jeremy's old shoes break and he is forced to wear Velcro cartoon character shoes provided by the guidance counselor, he finds out who his real friends are and what he truly needs not wants. This book covers many categories of contemporary realistic fiction. First, a majority of the book takes place in a school. Many students will be able to relate to the pressure Jeremy feels to fit in with his peers. Second, he faces emotional challenges when other students make fun of him and he struggles with not being ale to afford the shoes. Third, it covers social diversity. Jeremy is an African American boy living with his Grandma. No other parental figures appear in the story. While it is clear that Jeremy's grandma can provide for his needs, it is also clear that they are faced with a lower socioeconomic status. I absolutely love the story this book portrays. It shows diversity in family structures, economic funds, giving, and friendship. The young boy in this story learns the importance of spending money and saving money on things that you need rather than what you want to fit in at school. In the end, it was winter and he didn't even need his tennis shoes anymore and he was grateful to have his nice new snow boots. Jeremy wants "those shoes", if you have ever struggled financially, you know exactly what shoes he wants, expensive, new, hip, cool shoes. His grandma says they don't have room wants, just needs. So, Jeremy gets a pair of used shoes from the school counselor. He's embarrassed and sad. What happens next is powerful and offers a great message about having good character. Text and illustrations are both of high quality and help to deliver an important life lesson in a natural manner. Didn’t show friendship to each other the short story would have a completely different theme and thesis, That’s why showing friendship help you and your friend out. Jeremy wants a pair of black high-top sneakers that all the boys at school have, only to find his grandma refuses to buy him some as they cannot afford them. Things got bad at school when Jeremy shoes fell apart at school, if that’s not embarrassing enough the only shoes available are sneakers with a cartoon of an animal on the side! Jeremy tries his luck and buys sneakers at a local thrift shop even though they were small, giving him blisters. However something did come out of it when his gener Jeremy wants a pair of black high-top sneakers that all the boys at school have, only to find his grandma refuses to buy him some as they cannot afford them. Things got bad at school when Jeremy shoes fell apart at school, if that’s not embarrassing enough the only shoes available are sneakers with a cartoon of an animal on the side! Jeremy tries his luck and buys sneakers at a local thrift shop even though they were small, giving him blisters. However something did come out of it when his generosity turns into friendship when he gives the shoes to another child who really needs them! 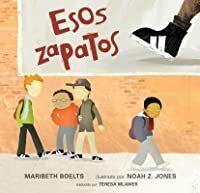 The author Maribeth Boelts is a former teacher and has won several awards for her books, her message of the books shows she understands how children feel and tried to put across a message. Empathy is a big message of the book and would be great to use in a classroom. This book is clever and contains a powerful lesson about differentiating about wants and needs and not being materialistic. The only think Jeremy wants in the world is a new pair of shoes that all of his classmates have. Jeremy feels embarrassed that he cannot afford these shoes. One day, Jeremy's grandma takes him shopping and they find these shoes a thrift store. He wears them to school despite the shoes being much too small. When Jeremy sees a fellow student on the playground with his toes poking out the front of his shoes, he learns a valuable lesson about being selfless and appreciating what you already have. I t The only think Jeremy wants in the world is a new pair of shoes that all of his classmates have. Jeremy feels embarrassed that he cannot afford these shoes. One day, Jeremy's grandma takes him shopping and they find these shoes a thrift store. He wears them to school despite the shoes being much too small. When Jeremy sees a fellow student on the playground with his toes poking out the front of his shoes, he learns a valuable lesson about being selfless and appreciating what you already have. This is the story of a boy who wants the same shoes as everyone else. All the boys in school have those shoes, and Jeremy wants them too. His Grandma says that there's no room for want, only what you need. Still, Jeremy wants the same shoes as everyone he sees walking through the halls or in the lunch line. When his shoes break during kickball, Jeremy needs to use shoes from the guidance counselor. He's upset by the childish velcro shoes, even if they were the only ones in his size. The kids in This is the story of a boy who wants the same shoes as everyone else. All the boys in school have those shoes, and Jeremy wants them too. His Grandma says that there's no room for want, only what you need. Still, Jeremy wants the same shoes as everyone he sees walking through the halls or in the lunch line. When his shoes break during kickball, Jeremy needs to use shoes from the guidance counselor. He's upset by the childish velcro shoes, even if they were the only ones in his size. The kids in the class laughed at him, except for Antonio. When his Grandma takes Jeremy shoe shopping, but those shoes were way too expensive. Jeremy suggests the thrift shop, and takes his Grandma there. They search thrift shops, until they find those shoes. But! They are not the right size, they are way too small. Jeremy buys them anyway with his own money. His Grandma buys him his needed snow boots, and tries to ignore that Jeremy's shoes are too small because he wanted those shoes so badly. One day at school, Jeremy noticed Antonio's shoes were taped up and that Antonio's feet were smaller than his. Antonio and Jeremy play and the go to Jeremy's for dinner. There Antonio sees those shoes, but doesn't understand why Jeremy never wears them to school. Jeremy decides to give Antonio his ill-fitting shoes. Snow is falling, so he puts on his snow boots and runs to secretly give Antonio the shoes. It makes Jeremy happy to see Antonio so happy, even if he still has to wear the velcro shoes. But when it is time for recess, there is snow everywhere and everyone has to wear their snow boots. The story could be anyone's story. It is the tale of a kid who wanted something and was embarrassed that he did not have it. The story showed realism in the way the Grandma reacted to the price of the popular shoe, the small details of shoes held together by tape. It's a reality that not everyone is completely familiar with, but it's a known reality none-the-less. The story was one of moral dilemma, as Jeremy wanted the shoes but he knew that Antonio needed them more, and could actually fit in them. The multicultural elements of the story come into play with Jeremy and his Grandma and the classmates at Jeremy's school. Jeremy and his Grandma are Black, and the illustrations in the story show the different features of his classmates0 their skin color, hair color, etc. This is not only an example of multicultural literature, it also shows realism by reflecting the different demographics found in most communities. The short story “Those Shoes” is a charming picture book with a lesson that every child should learn. The story begins with Jeremy and his love for the black shoes with a white stripe. The shoes were his dream, everyone had them and he wanted it. One day at recess, Jeremys shoes break apart and he is forced to use left-over shoes that were stranded at school. Everyone made fun of Jeremys school shoes, but he had no choice but to wear them. After a couple of days, Jeremys grandma begins to notice The short story “Those Shoes” is a charming picture book with a lesson that every child should learn. The story begins with Jeremy and his love for the black shoes with a white stripe. The shoes were his dream, everyone had them and he wanted it. One day at recess, Jeremys shoes break apart and he is forced to use left-over shoes that were stranded at school. Everyone made fun of Jeremys school shoes, but he had no choice but to wear them. After a couple of days, Jeremys grandma begins to notice how upset he is so she offers to go see how expensive these important shoes are. When they go to the store, Grandma see’s the price and knows it’s out of her financial reach so Jeremy suggests a thrift shop. Three thrift shops later Jeremy finds the shoes he wanted, just a little too small. Jeremy forced his feet into the shoes, bought them with his own money and attempted to stretch the out as time went on, but sadly they did not. The next day, his Grandma bought him new black snow boots for the inter season that was coming up. The next day at school, Jeremy realizes the one kid who didn’t laugh at him Antonio, with shoes held together by duct tape. That recess they played ball and Jeremy invited him over for dinner. That night Antonio noticed Jeremys shoes that did not fit him, and loved them just as much as he did. The next day, snow starts falling and Jeremy brings the shoes to Antonio’s to drops them off and run. Rather than being selfish, Jeremy was able to separate his own wants and provide to someone who needs it. This selfless act is important for children to understand especially in society nowadays where people are so concerned with physical objects. Teaching children to be empathetic and caring towards others with expecting nothing in return is a pivotal lesson every kid should grow up knowing. This book shows perfectly while some of us are sitting wanting things that we can’t have, there are others wanting things they need and can’t have. This review has been hidden because it contains spoilers. To view it, click here. The story starts with a young boy dreaming of a specific pair of shoes, staring at a giant poster for Those Shoes. He tells his grandmother that he wants them; she reminds him that he needs boots. He then describes all of the children at his school that have Those Shoes. The guidance counselor has to give Jeremy a pair of shoes because his broke while he was at school. All of the children laugh at him. Jeremy is obsessed with the shoes! Grandma takes Jeremy to the store to see if they can get th The story starts with a young boy dreaming of a specific pair of shoes, staring at a giant poster for Those Shoes. He tells his grandmother that he wants them; she reminds him that he needs boots. He then describes all of the children at his school that have Those Shoes. The guidance counselor has to give Jeremy a pair of shoes because his broke while he was at school. All of the children laugh at him. Jeremy is obsessed with the shoes! Grandma takes Jeremy to the store to see if they can get the shoes but they are too expensive for her. Jeremy recommends going to the thrift stores. At the third store he finds Those Shoes for $2.50! The shoes don’t fit. Grandma wouldn’t pay for them but Jeremy buys the shoes that are too small. Jeremy doesn't even wear Those Shoes to school because they are too small. At school he sees Antonio’s shoes are tore up like his were before. Antonio is the only child who didn’t laugh at the shoes the guidance counselor gave him. That evening Antonio comes over and eventually asks why he doesn’t wear Those Shoes. Jeremy ended up taking his Shoes to Antonio’s doorstep the next day. The art is chunky, flat and solid. The art also fills the page, edge to edge. The plot of the story is a young African American child who lives with his grandmother, longing for something they cannot afford but ultimately realizing he has what he needs; friends, love, and even snow boots. This is also the theme or the moral; knowing the difference between your friends and the difference in what you want and want you need. The story is a nice one to read to school age children that would understand the lesson being conveyed. The book is realistic and something that most people will be able to relate to, longing and acceptance is something everyone goes through at some point. 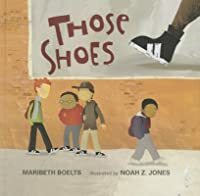 Those Shoes by Maribeth Boelts is a story that truly touched my heart. Those Shoes is the story of a little boy who doesn’t have much money, and is feeling very jealous of everyone in his class who has a special pair of shoes. The little boy in the story really breaks down when his own shoes fall apart, and he has to visit the guidance counselor to pick out shoes from a box. The new shoes that he selects are too young, according to the boy, and many him feel even worse. When the little boy begs his grandma for new shoes, she agrees to look at the resale shop to see if they might have a pair of the shoes he desperately craves. Indeed they do! Unfortunately, they are too small. The boy buys them anyways. In the end, the little boy gives away his favorite new shoes to a boy in his classroom who is also in need of new shoes. Giving away what he adored most in the story is a touching moment for the reader, and makes the main character feel proud. This book would be useful for students of any age, because the story has so many levels. At the most elementary level, it is about a boy who can’t have what he wants. However, when you look deeply into the story, the book talks about poverty, difficult decisions, jealousy, and being selfless. The voice in the story is also very strong! The grandmother’s voice is very authentic feeling for the story, and I could absolutely picture another adult speaking to a child in the same way. I really enjoyed reading this book and its many purposes! It would be a great fit for reading, writing, or even character development. Jeremy is a child who needs a new pair of shoes. He wants his grandma (who I assume is his sole guardian) to buy him "those shoes" that everyone at his school seems to own. When the guidance counselor gives Jeremy a pair of "kiddie" shoes, he is embarrassed and all but one of his classmates laughs at his shoes. Jeremy's grandma takes him shopping only to discover she can not afford the shoes. Jeremy later finds the shoes at a thrift store but they are too small. At the end of the story, he choos Jeremy is a child who needs a new pair of shoes. He wants his grandma (who I assume is his sole guardian) to buy him "those shoes" that everyone at his school seems to own. When the guidance counselor gives Jeremy a pair of "kiddie" shoes, he is embarrassed and all but one of his classmates laughs at his shoes. Jeremy's grandma takes him shopping only to discover she can not afford the shoes. Jeremy later finds the shoes at a thrift store but they are too small. At the end of the story, he chooses to give the too small dream shoes to the classmate who had torn up shoes but a big heart! Those Shoes (A Charlotte Zolotow Award Nominee, 2008) A touching story that follows a young boy, Jeremy, that has no room for “wants” only “needs.” but Jeremy desperately wants those shoes - the pair of high tops with two white stripes. Jeremy’s loving grandmother says he only needs a pair of winter boots. Jeremy struggles with this dilemma, he wants “those shoes” - especially after his own sneakers fall apart at school and he has to wear some given to him by the guidance counselor that have an Those Shoes (A Charlotte Zolotow Award Nominee, 2008) A touching story that follows a young boy, Jeremy, that has no room for “wants” only “needs.” but Jeremy desperately wants those shoes - the pair of high tops with two white stripes. Jeremy’s loving grandmother says he only needs a pair of winter boots. Jeremy struggles with this dilemma, he wants “those shoes” - especially after his own sneakers fall apart at school and he has to wear some given to him by the guidance counselor that have an embarrassing cartoon character on the side. His classmates take note of his cartoon character shoes and laugh at him. All except one boy.. Jeremy’s grandmother takes him out to buy those shoes he’s been wanting, only to find them in a size too small for Jeremy. Jeremy battles with himself on what to do with those shoes and ultimately finds exactly what he should do with them. This story is relatable for all who have ever felt the need to fit in or did not have the means to do so. Since this story is told in Jeremy’s perspective, we are able to sympathize with Jeremy and his situation. This children’s book hits on the ideas of wants vs. needs and would be great for teaching different perspectives. However, despite the great lesson of giving, my favorite aspect (and what made it a WOW book for me) is that it ends with a subtle reminder of what was even more important the whole time - the children are playing together and having fun, which had nothing to do with the shoes they had on. Summary: Those Shoes is a story about a young boy named Jeremy who always catches himself wanting a pair of those shoes that everyone else at his school has. His grandma explains to Jeremy that they do not have room for wants and needs. Jeremy’s shoes end up falling apart, and the guidance counselor gives him some. Jeremy also goes to the thrift store to buy a pair because he’s so determined to have them, but they’re too small. At the end of the story, Jeremy realizes the boots his grandma had g Summary: Those Shoes is a story about a young boy named Jeremy who always catches himself wanting a pair of those shoes that everyone else at his school has. His grandma explains to Jeremy that they do not have room for wants and needs. Jeremy’s shoes end up falling apart, and the guidance counselor gives him some. Jeremy also goes to the thrift store to buy a pair because he’s so determined to have them, but they’re too small. At the end of the story, Jeremy realizes the boots his grandma had given him, and the given chance to make a friend happy, are much better than those shoes. Evaluation: I gave this book an overall rating of 5. I think this book is a very interesting and engaging book. I think it relates very easily to children that have ever wanted anything, but they were told no. This book can relate to students of all age groups. I heard this story through an audio version of the book. It's about a boy named Jeremy who lives with his grandmother. Grandma struggles to make ends meet, and there's no room for wants in their home, only needs. However, Jeremy wants a pair of the shoes that all the other boys at school are wearing. He's never had anything like these shoes, and is dying to buy a pair. The school guidance counselor provides Jeremy with a "new" pair of shoes, the same kind Jeremy's little cousin wears - you can f I heard this story through an audio version of the book. It's about a boy named Jeremy who lives with his grandmother. Grandma struggles to make ends meet, and there's no room for wants in their home, only needs. However, Jeremy wants a pair of the shoes that all the other boys at school are wearing. He's never had anything like these shoes, and is dying to buy a pair. The school guidance counselor provides Jeremy with a "new" pair of shoes, the same kind Jeremy's little cousin wears - you can feel the humiliation in those words as he says them. He persuades his grandmother to check out all of the local thrift shops to find the shoes, and indeed they buy a pair at the store, unfortunately they're too small for Jeremy but grandma buys them anyway. This is the touching story of how Jeremy is impacted by the fact that he's different than his peers because of a lack of financial resources. He lives in a home that is filled with love and nurturing, and he knows how much his grandmother struggles to care for him. Out of the kindness that Jeremy receives, he's able to give kindness to another child in the story in an unexpected turn of events. Everyone in Jeremy’s school seems to own a pair of those shoes: the black high tops with two white stripes. Everyone except Jeremy, that is. When he tells his grandmother about the shoes he wants, she tells him that what he needs is a new pair of snow boots. When Jeremy’s own shoes fall apart the school guidance counselor helps him find a pair of shoes from the school donation box. The shoes that fit are blue Velcro shoes made for little kids. Jeremy is embarrassed and all of his classmates teas Everyone in Jeremy’s school seems to own a pair of those shoes: the black high tops with two white stripes. Everyone except Jeremy, that is. When he tells his grandmother about the shoes he wants, she tells him that what he needs is a new pair of snow boots. When Jeremy’s own shoes fall apart the school guidance counselor helps him find a pair of shoes from the school donation box. The shoes that fit are blue Velcro shoes made for little kids. Jeremy is embarrassed and all of his classmates tease him, except for one little boy. Jeremy and his grandma venture out in search of those shoes at an affordable price. Finally, he spots them at a thrift store. Even though they’re too small, Jeremy buys them with his own money. Jeremy soon realizes that owning those shoes isn’t as important as helping a friend in need. Children and adults alike are able to relate to Jeremy as he experiences longing, embarrassment, and the delight that comes with helping others. The themes of poverty, materialism and the value of helping out those in need are expressed in a genuine way without being overly didactic. The illustrations genuinely depict the multicultural characters and many children will feel represented in this story. I thought this book was a great lesson for students to not also understand what life is like for someone struggling with poverty, but to help them realize how blessed many of them are with what they have. The main character does everything he can to get a new pair of shoes that will help him fit in at school. But in the end, his friendship was more important than any pair of overrated shoes. This book teaches children another example of what poverty is and how it affects someones life. This story is told in such a way that young readers can connect and relate to the ideas told. The setting of this story is within a school and a boy and his grandmother living in low socio-economic times and there being no other parental guidance for young Jeremy. Great story to allow for an experience of a mirror while reading this book to children who are learning and discovering the things that truly matter in one’s life. I thought this was interesting... I really hate the way brands have influenced how our kids dressed ,Started jackets and Air Jordans come to mind...I do like the way the boy in this story comes to a compromise over the shoes and does another child a good deed. Good lesson here. illustrations are wonderful. Important book to share with your child and/or your class. And a great reminder for teachers about the children who may be in your classroom. I don't normally rate children's books with 5 stars, but this one deserves it. Please read this book--it's a wonderful story about a young boy, a pair of shoes, and a whole lot of humanity. This one is fantastic! What an important message and lesson for all of us, young and old. This is a powerful picturebook that explores the tension between wants and needs when family budgets are tight. Have you ever craved for a pair of shoes everyone else has? This is a book in Spanish, and with my little Spanish, I tried to understand it. Everyone in his school seems to be wearing this cool pair of shoes. His grandma cannot afford it, so he got a pair from the second-hand store. But the size was too small for him. He gave the pair to his friend, who also needed new shoes. With his winter boots, he still can run and have fun with his friends. Does one really need brand new shoes? I don't recall every having this kind of craving; maybe this (Candlewick) book will help me empathize with those who do. I got this from the library on the advice of a "books to read for Thanksgiving" list, and it choked me up a bit. It's a sweet book that kid's will understand. It's not preachy. I love it.